This article explores a significant puzzle: the persistence of modern representative democracy in post-independent India. It demonstrates how a politics of recognition, based on identities of caste, language, and religion, is crucial for understanding the origins, character, and trajectory of modern Indian democracy. These politics suffer various infirmities. Yet liberal, Marxist, and republican critiques of the politics of recognition in India, while offering valid theoretical alternatives and powerful moral visions, also suffer their own limitations. Perhaps more importantly, they evade questions of historical possibility, political efficacy, and practical reason that confront every political theory. 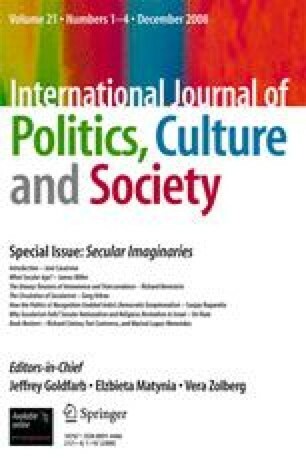 The relative historical predominance of the politics of recognition in post-independent India, in contrast, reflects its capacity to engage powerful social imaginaries that enabled the realization of democratic norms, institutions, and practices. The general argument put forward develops several key themes that distinguish Charles Taylor’s philosophical vision of alternative modernities—the power of social imaginaries, nature of explanation in the human sciences, and vicissitudes of culture, politics, and history—to explain the trajectory of modern Indian democracy. An earlier draft of this paper was presented at the Secular Imaginaries conference, held in honor of Charles Taylor, from 3–5 May 2007. I would like to thank Benjamin Lee, Dilip Gaonkar, and Jose Casanova for inviting me to participate in the proceedings. Discussions with Courtney Jung, Sudipta Kaviraj, and Sanjay Reddy helped me to develop the argument presented here. Tanni Mukhopadhyay carefully read successive drafts and provided critical feedback. I am solely responsible, however, for any errors of fact or interpretation that remain.